What Are the Symptoms of Congenital Sucrase-Isomaltase Deficiency? The clinical presentation of Congenital Sucrase-Isomaltase Deficiency (CSID) can vary from mild to severe chronic, watery diarrhea and/or abdominal pain. Often, symptoms do not manifest in infants until they begin to ingest sucrose and starch-containing foods (for example, juices, solid foods, and medications sweetened with sucrose). Chronic, watery diarrhea and failure to thrive are the most common symptoms in infants and toddlers. Other manifestations include abdominal distention, gassiness, colic, irritability, excoriated buttocks, diaper rash, and vomiting. 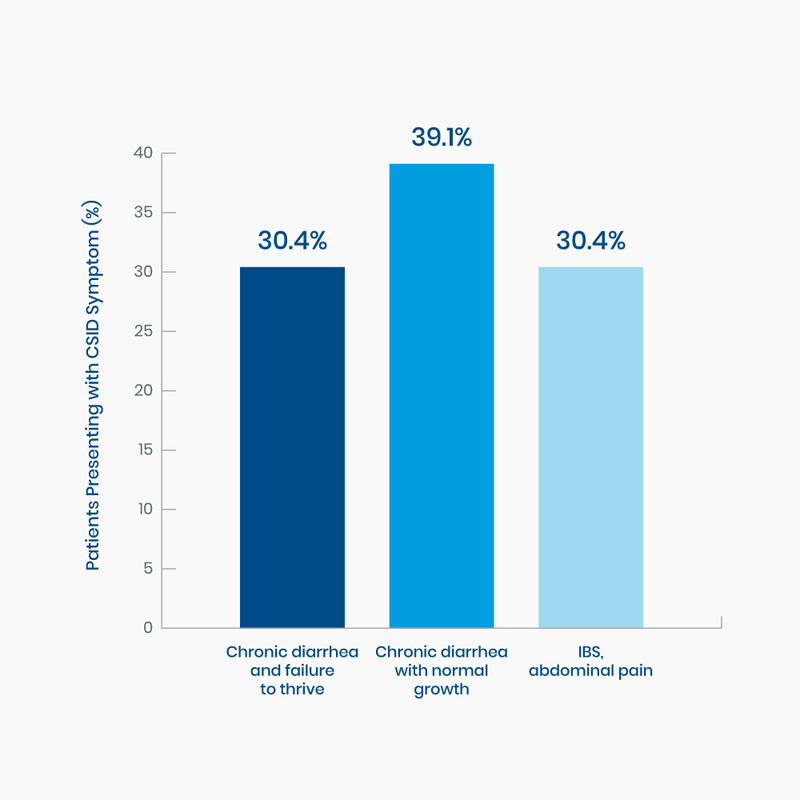 The gastrointestinal (GI) symptoms associated with CSID tend to persist in adults, because CSID is not a disease that a patient can outgrow. Symptoms may appear less severe in adults compared to those experienced by children. In some adults, symptoms may be limited to an increase in bowel frequency, abdominal distention, and flatulence although episodic watery diarrhea upon ingestion of high levels of sucrose may occur.1 In certain patients, diarrhea may alternate with constipation, leading to a misdiagnosis of CSID as irritable bowel syndrome-alternating (IBS-A). As with pediatric patients, the clinical presentation in adults varies dramatically from patient to patient. Some patients with CSID may experience several severe symptoms in response to consumption of sucrose, while others may experience only mild discomfort. Gudmand-Høyer E. Sucrose malabsorption in children: a report of thirty-one Greenlanders. J Pediatr Gastroenterol Nutr. 1985;4(6):873-877. Antonowicz I, Lloyd-Still JD, Khaw KT, Shwachman H. Congenital Sucrase-Isomaltase Deficiency. Observations over a period of 6 years. Pediatrics. 1972;49(6):847-853. Treem WR. Clinical aspects and treatment of Congenital Sucrase-Isomaltase Deficiency. J Pediatr Gastroenterol Nutr. 2012;55(suppl 2):S7-S13.